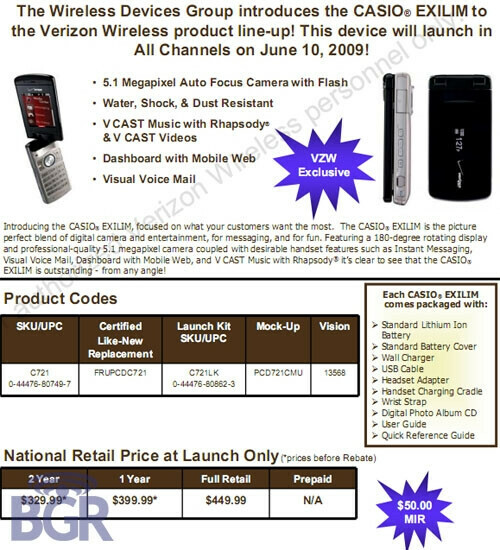 Just one day after we learned that the Casio Exilim C721 camera phone will launch by Verizon on June 10th, we now know what the pricing will be. Expect to pay a premium for having a phone with a rotating display (though only QVGA) and a 5MP camera with autofocus, flash, and a 3x optical zoom. Two year contract pricing will be $279.99 after a $50 rebate, $349.99 after rebate with a one year contract, and $449.99 full retail. With the enV Touch (and Dare) sporting a 3.2MP autofocus camera, and the Samsung Omnia with a 5MP cam, and at a lower cost, we're not sure how well the Exilim will end up doing. Just remember what happened with the 3MP Samsung FlipShot, first it was released for $199 (2 year), then a few months later increased to $299, and now is currently $99. We're not saying this is going to happen with the Exilim, but would you pay $279 for it? Let us know in the Comment section below. I don't know anyone with the A990 or the Flipshot, so this probably won't be that popular, either. maybe it's just me, but i would NEVER buy a Casio phone. i remember wearing a casio watch when i was a kid and it was the worst. plus the phone is really ugly. the fact that it is mil spec on water, dust, and shock will make this popular for some. i dont thinks its gonna matter if the phone is water, dust, or shock proof, i just dont see the phone selling especially for that price! when you get the omnia for a lot less. want a dumbphone with a good camera the dare or touch gonna be a lot better than the casio. even if the phone was bullet proof i wouldnt get it. this phone would of been good months ago (or a few years ago)! The GZone Boulder sold pretty well at that price, and is doing good now at 149.99 after rebate. It doesn't have the camera that the Exilim does either. Well, I was willing to pay about $180 for this phone, but if the camera photo quality is as good as a comparable casio exilim camera, I think I'll be willing to shell out an extra $100 to have two in one in my pocket at all times. Does anyone know how Verizon usually releases phones.. is it necessary to pre-order or should I just show up at the store on June 10th? just show up. you'll probably be the only one asking for it, so make sure they have it in stock! That is way too much money. I think we're missing the point here, guys... This phone has the potential to be the first real camera-in-a-phone that Verizon has ever released. This is not about hi-res screens, good looks, or even price for that matter. Obviously the Casio bashers have never owned an Exilim digital camera, otherwise they would know that Casio was years ahead of Canon and Nikon in digital cameras before they began closing the gap. Since Casio has been building their 'Exilim' brand of digital cameras for many years now, it is very significant that they are putting the Exilim name on this phone. This is like if Sony released a new PHONE called 'Cybershot S721' or if Canon released a PHONE called 'PowerShot P721'. With its image stabilization to overcome one of the worst plagues of phone cameras--blurry photos--and all of Casio's digital camera experience to boot, I am in high hopes that this time around VZW is offering us a phone with a real camera, not a toy. I agree. The whole point of this phone is that its Exilim. Similar phones by Casio have done well in europe and asia so it should do nicely for verizon, as long as the camera is actually good. 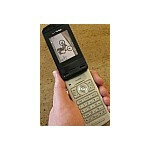 I currently own a Samsung A-990, purchased in July 2006 from Verizon. I've enjoyed having this phone for nearly three years, now, and have not found a satisfactory candidate for replacing it (even though I'm a year over the "New-Every-Two" period) - until this Casio Exilim just came out today (June 10). The Samsung A-990 was just about everything I had hoped it would be. Very good reception in all areas I travel, high-quality camera (for a phone in its day), VZ Navigator, flip style, able to be holstered / removed / used with one hand (without looking at the screen - sometimes), excellent voice dialing recognition, and robust (It's been dropped accidentally too many times to remember). I didn't upgrade to the newer flip-shot because it didn't really improve the camera. I've been wanting to upgrade to a higher resolution - hoping for 8 or 10 - but 5.1 Mp is enough better to make the upgrade now. Regarding Casio cameras and optics - I was also a doubter. Having a variety of Canon, Nikon, Minolta, and other cameras, I never would have given Casio a thought, until my teenage daughter bought the Casio Exilim EX-S10, a very small and light camera which fits easily in her small purse. Both she and I have now used that camera for more than a half year, and frankly, I'm amazed with how good the photos turn out. Except for blowing things up larger than 8x10, special lighting situations, or superzoom, it actually comes darn close to cameras costing many times as much from the industry leaders. And yes, she has also given her camera its share of knocks and bumps, and it just keeps going. Most of the above comments so far have been by people who have not indicated having experience with either the Casio Exilim products or Samsung A-990 (or FlipShot). I'm an experienced user of both - and I think this new Casio Exilim phone seems worth a "shot" - even at a somewhat high price.